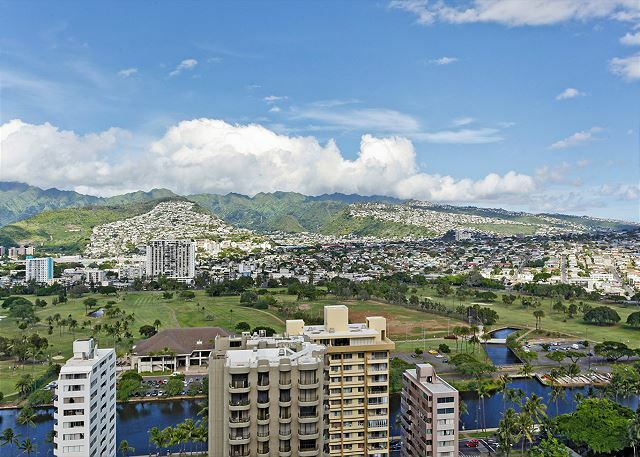 Waikiki Banyan #2601-T2 - One-bedroom vacation rental with AC, WiFi, parking and short walk to beach! Mahalo, George! We appreciate the feedback and will look forward to your next visit! We would definitely stay here again and recommend to friends. Mahalo for posting a review and recommendation! So glad to hear you enjoyed your stay in this great condo! We look forward to your next visit! Great Condo, Great Location, Great Property Management! This was our first trip to Honolulu, and my wife and I brought our two kids (3.5, 1.5). 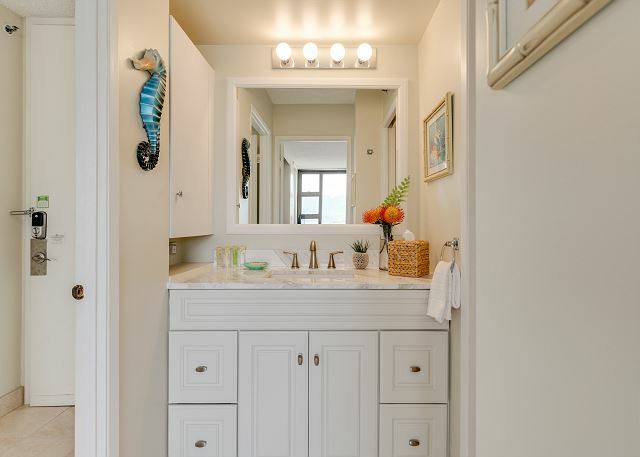 We were looking for a condo so that we could have access to a kitchen, but we wanted to be close to the beach, have a pool, parking, and access to some play areas. The Waikiki Banyan checked all of the boxes, and this condo was fabulous. Large windows provided a great view of the city, and morning sunshine meant afternoon (and naptime) shade. The room was clean, there were beach toys and accessories on the patio, and Bryon did a great job meeting us in the evening, introducing us to the room and showing us how everything worked. The pool was easily accessed from the room, the playground was a hit with the kids, and it was a seven minute walk to the kids beach, a trek we made daily. The air conditioner was very effective in keeping the room cool, and we had no issues fitting everyone into the bedroom. There was plenty of space to stretch out, and we were close enough to everything we wanted to do that we couldn't have been happier with the space. Checkout was a breeze, I was very happy with the service from Captain Cook. The one improvement to make would be a better locking mechanism on the windows, but I have addressed that with management directly and I'm sure they have reviewed my notes on that. If you have questions about this unit, call Captain Cook! They are very user friendly and happy to help out over the phone for trip planning. We enjoyed our stay here, and I hope you do, too. Mahalo, for the wonderful detailed review and recommendation! We're delighted to have provided all of the needs you required for an enjoyable family vacation! It makes our day to read such an enthusiastic review and we're so glad that you appreciated the convenient location and the services of our team here at Captain Cook Resorts! We did get your recommendation about the windows and are looking into it, thank you for alerting us to family needs! We look forward to welcoming you back on your next visit to Hawaii and Waikiki! We, honestly, are the lovers of staying at Waikiki area and have lots of experience using various hotels and condominiams in this area. This time, we enjoyed here so much because of having good mountain view and good facilities inside room. We have already used Waikiki Banyan but this room is better than before. One wish from us is to use the linen of the bed should be complete 100% Cotten. Except this, this is very qualitative and reasonable. Mahalo for the wonderful review and thank your for choosing Captain Cook Resorts! We are pleased that your stay was enjoyable and we exceeded your expectations! We provide premier quality sheets (60/40 cotton blend) and plush 100% cotton European style thick terry towels for our guests. Thank you for your feedback and we look forward to your next visit. Mahalo! We appreciate the feedback and and 5 star review! 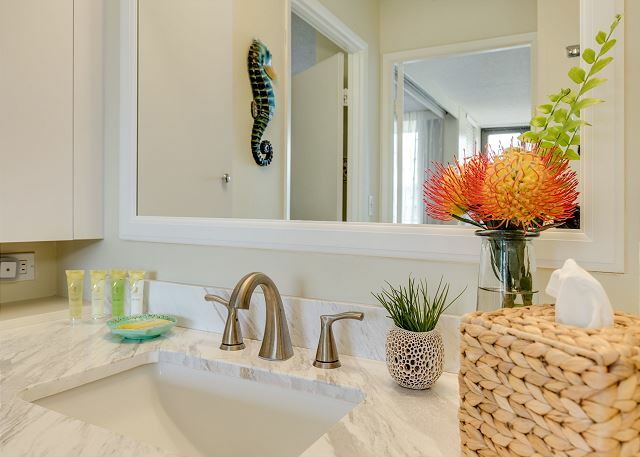 During your next visit, a quick call to your property manager will resolved any issues during your stay. We will look forward to your next visit! The Captain Cook team was very attentive and we were grateful they accommodated our last-minute request for a late checkout. We were happy with this rental. It was clean, had everything we needed and in a great location. Mahalo for your wonderful review and recommendation! So glad you were happy with your stay. We look forward to welcoming you back in the near future. The property was clean and your property manager was informative and punctual. We did find that the accommodation did not suit 5 adults and is more suitable for two adults with children. The location was ideal and close to most amenities. The beds in the bedroom were very comfortable. The kitchen was well stocked. Perhaps the installation of a dishwasher might be a good thing. More kitchen towels would be helpful, one is not enough!!! I would recommend this property to others. Mahalo! We appreciate the feedback and positive comments of your recent stay. We are glad you appreciated the location of this fabulous condo, and your property manager was available and informative during your stay. We agree 5 adults would not be suitable in this one bedroom condo. As stated in our description we recommend 4 guests as the sleeping accommodations are a queen bed, one twin and the sleeper sofa is best for 1 adult or 2 small children. 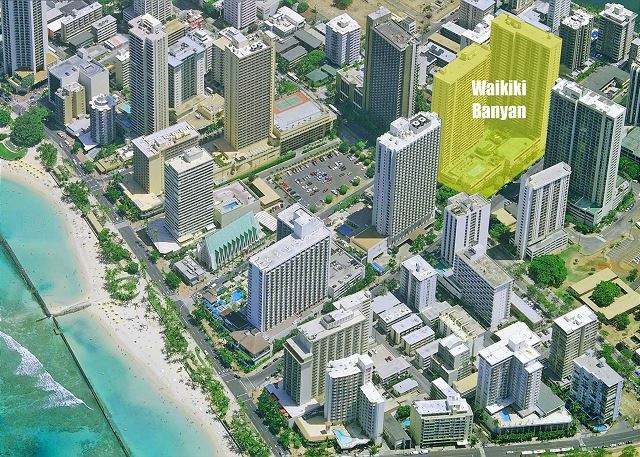 Unfortunately Waikiki Banyan is unable to install dishwashers due to the building plumbing requirements. We are sorry you only had one kitchen towel, In the future, please notify your property manager immediately to resolve any issues that may arise during your stay. We hope you will keep us in mind for your next visit to Waikiki and look forward to seeing you again. Greeted by the mountain view! Perfect rental with easy access to amenities and walking distance to Waikiki beach, restaurants and shops etc. Managment was great, very friendly, helpful and attentive. Had family on vacation with us who also rented at a Captain Cook location and was as well very satisfied with their overall stay. Would definitely recommend and will be more than delighted to stay here again. Mahalo, for the lovely review and for choosing to stay with Captain Cook Resorts during your recent visit to Hawaii. We're so glad you and your family enjoyed your stay! It's always great to get this kind of feedback and we are pleased that you appreciated the location of this great condo! We would be delighted to welcome you back on your next visit! Over all we are enjoyed staying waikiki banyan. Mahalo, for the nice review and feedback! Hope you are able to plan a return trip soon! Great customer service from start to finish. Would highly recommend using Captain Cook Resorts. The photos and description of the apartment was as expected - good location, clean, comfortable, great view, all the required amenities. This place was cute and close to the beach and many other things. Enjoyed our stay very much! Thank you. Mahalo, for the great review! We're so glad you enjoyed your stay and pleased that you liked the convenient location of this fabulous condo! We look forward to seeing you on your next visit! My teenage daughters and I spent 11 days (July 19-30) at the Banyan 2601-T2 and would definitely recommend it. It was clean with a beautiful view. My girls loved that it was so close to the beach and that they had WiFi. Had a minor issue with the bathroom vanity light fixture and it was taken care of as soon as I got a hold of the property manager. Parking garage was very confusing at first but something you get use to. Only thing I did not like was that the day after I arrived I received a phone call asking what time I would be checking out on the 30th. Not something I really wanted to think about on my 2 day there. Waikiki Banyan .....not long enough! My daughter and I stayed for 10 days in July. Perfect weather. Great location. Parking...done. WiFi....done. Cable TV....missing a few. Beds...fine. Kitchen...stop by Safeway (5 min away) and everything else you need is in the room. 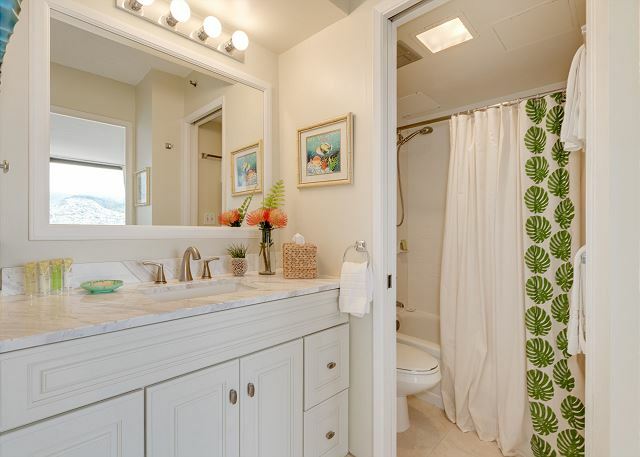 Bathroom could use an update but not terrible. Close to everything. I highly recommend the Banyan. #2601 is fine for 2. Three works if one is a small child but 4 is a push. I plan to return in the future. This condo is great! Comfortable, has everything you need. Quiet, close to beach,clean, friendly and helpful staff. Quick to assist if needed. Parking garage if you have a car rental. New digital individuaized number door coded locks so no need for a key. Priced right so you can spend saved money on the sights in Hawaii. You will not be disappointed staying at the Waikiki Banyan and booking with Captain Cook Resorts. It makes our day to read such an enthusiastic review, Heidi - Mahalo! We’re happy to have provided all of the needs you required for a wonderful vacation! It's what we're here for! We look forward to your next visit! 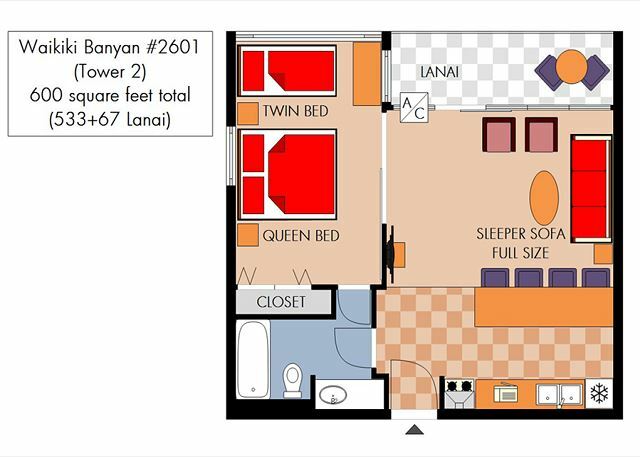 The Unit could use some updating and painting, but it was comfortable and convenient having two beds, so guests didn't have to sleep in the living area. View of the mountains was fabulous, and also of the city lights at night. Best was two block walk to the beach. Also good was being away from the most commercial area of Waikiki. Two blocks to zoo. Mahalo Marilyn, for taking the time to post your review and recommendation. We're so glad your visit was enjoyable and appreciated the great location. I will pass your feedback onto the team, and we look forward to your next visit! Mahalo, for leaving such a great review and recommendation! We are happy you enjoyed your stay and hope you’re able to return for another visit soon! to come back to and relax. Mahalo Karin! So glad to hear you enjoyed your stay. We look forward to having you back for your next vacation! Mahalo for the 5-star review! Unfortunately, our system doesn't recognize Japanese, but we appreciate and value your business! Close proximity to beach. Perfect for a small family. Mahalo Gabriela! Hope you're able to visit us again some day! The location of this property was fantastic. It was close to the beach and bus stops. It was a bonus to have a separated bedroom for the real early risers and also to have a kitchen. Don't shy away from this property if you need the extra sleeping accommodations - I slept on the sofa bed and it was extremely comfortable. I would definitely recommend this suite. The only downside was the elevator "down" button was out of order and we always had to go up to get down. Mahalo, Kathy, for the great review and recommendation! We appreciate your feedback! Awesome stay for five nights. Condo is clean and well laid out. All appliances worked without a problem. Management are super friendly and helpful. Recommended highly! Mahalo, Tim! So glad you enjoyed your stay! Hope to see you again soon! The condo was as described and worked well for our group of 4 surfergirls -- 2 slept on the queen, 1 on the twin and the 4th on the sofa which was a surprisingly comfortable sleeping spot. Great view of the canal and mountains. Unit stays cool -- only gets a few hours of direct sun in the morning -- we didn't need to turn on the air-conditioner at all. Cutting boards were missing, but new ones were delivered to us and we got lots of use out of them as we cooked several meals in the unit. Would rent this unit again. Like the location and the parking garage is one of the best in the area. Mahalo for the thoughtful review, Lisa! Always happy to host surfer girls like you all! Hope you're able to plan another trip to visit us soon! Stayed here for a short stopover with 4 adults. Everything is as shown in photos. Bathroom and kitchen were clean but older and could use a bit of maintenance. But the location and comfort more than made up for it. Aloha and mahalo for the review, Linda! The carpeting throughout has been replaced with new laminate flooring. We hope you're able to return for another visit! 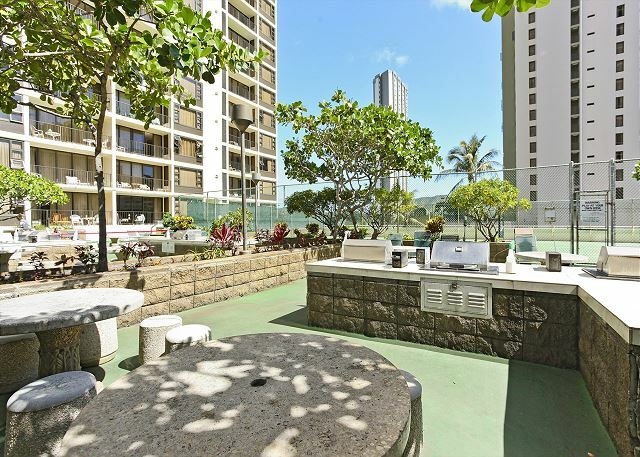 This condo had all the basic stuff we needed and was conveniently situated one block from Waikiki beach. The view wasn't of the beach but overlooked the golf course and mountains, so the night lights were very nice. Mahalo for taking the time to post a review of your stay! We appreciate the feedback! We had a great time in Hawaii and truly enjoyed our stay at the Banyan. We cooked a few nights, Bbq'd on level 6 and met some great people. Byron was a very welcoming host and he was genuinely kind to us. We didn't get a chance to say farewell so please pass on our 'thanks'. It was I'm sure you understand extremely disappointing the pool was out of action but we certainly didn't let it ruin our time away. Updating the unit would be nice but its not that bad. We liked it. Mahalo for the comments and recommendation! We look forward to your next visit! The condo is in an excellent location. The unit was as described & Captain Cook personnel are professional. The only problem encountered was a stopped up toilet which the owner needs to correct, but a phone call to Bryon & he was at our door in 10 minutes to take care of the problem. YES< I would stay again and I do recommend. We could not have been happier with our room: full kitchen, beautiful view off the balcony, plenty of dresser space (which was nice because we had three people), and coin laundry down the hall. The Waikiki Banyan has a great location, only two blocks from the beach, and we felt very safe walking at night in the area. People at the front desk were also very helpful with answering our tourist-type questions and the different buses to take to save money on cab fare. If we come back to Oahu, we would definitely stay at the Banyan again! Thank you! The Banyan is in an excellent location. This is it's main selling point. As a personal preference I did not care for the bar stools not having backs making them a bit uncomfortable when eating. I do realize this is a personal preference but if the Owner's were to update in the future this could be a consideration. Aloha and thank you for the review! We're so happy you enjoyed your stay. We have been having some unusually windy nights lately! The whistling/caulking issue has been reported to the manager. Mahalo again for staying with Captain Cook Resorts!